iRealHousewives | The 411 On American + International Real Housewives: Cynthia Bailey Says She Was ‘Shocked’ To See The Blogs Talking About Her New Relationship And Weighs In On Kenya Moore And Kim Zolciak-Biermann’s Feud! Cynthia Bailey Says She Was ‘Shocked’ To See The Blogs Talking About Her New Relationship And Weighs In On Kenya Moore And Kim Zolciak-Biermann’s Feud! Cynthia Bailey is taking to her Bravo Blog to dish on this week's episode of The Real Housewives of Atlanta. Cynthia Bailey reacts to seeing her new relationship in the blogs and talks about the blowout between Kenya Moore and Kim Zolciak-Biermann. BravoTV.com: What was it like seeing your new relationship on the blogs so soon? 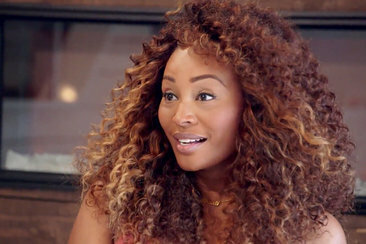 Cynthia Bailey: I was totally shocked to see the blogs talking about my new relationship/friendship with Will so soon. We had only recently met (at my 50 Shades of Cynthia birthday party) and had only gone out on our first date when a mutual friend posted a picture of us with her and her husband on her social media. Two days later, it was a hot topic on The Wendy Williams Show and all over the blogs. I was like, "Wait, we just met!" I wasn’t ready to go public, so we were both caught off guard. BravoTV.com: Did you think Will was moving too fast asking to come see Lake Bailey? Will is an amazing guy, and I’m definitely very attracted to him. I have no problem with Will coming to see Lake Bailey — once we get to know each other a little better. I was in a relationship for almost ten years, and dating is still new to me, so I want to take my time and enjoy the process. The lake isn't going anywhere. Maybe he will bring his leaf blower. LOL! BravoTV.com: What went through your mind during Kim and Kenya's confrontation? I was trying to figure out Kim's issue with Kenya. I know they had words at Sheree's housewarming party because Kenya (and Kandi) went into Sheree's unfinished basement. However, that was a while ago, and Kenya and Sheree have moved on since then and are cool now. I was very confused.